"National Parks Adventure" filming on location in Glacier National Park - what it was like. Packing a million dollar camera down a rough trail, by hand, in the middle of darkness for a one minute movie clip may seem extreme. Maybe so, but this shoot was for the just released, IMAX film, "National Parks Adventure." MacGillivray Freeman Films produced the film to celebrate the 100th anniversary of the National Park Service. Our caravan arrived and parked on the gravel, next to a wide opening in the forest that led to a narrow trailhead. It was well before sunup, and unfamiliar territory for the group made worse by the ongoing construction to rebuild the Going to the Sun Road. Car doors opened and the dim warm glow of dome lights provided some illumination. Everyone knew their job, they were prepared. Immediately upon exiting, bright headlamps shined around in the sky. Beams of light showed up on trees and bounced of mirrors and vehicles like jousting light sabers. After everyone had organized their gear, I led the guys down a short trail to where they would set up a very rare, IMAX film camera (one of only three like this one in the world). 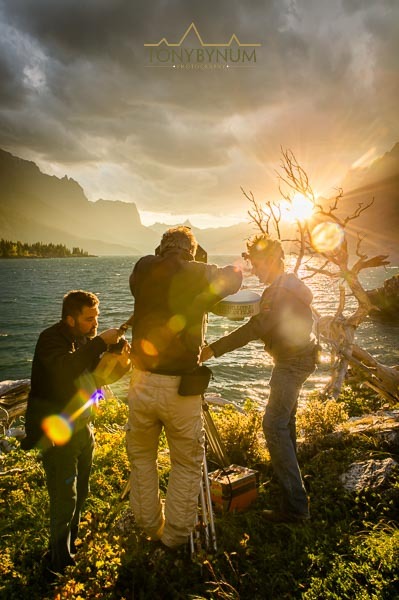 We were filming the infamous, "Wild Goose Island" sunrise scene over Saint Mary Lake - likely one of the most iconic national parks scenes in America. Still in the dark, I showed Brad Ohlund, Director of Photography, the exact locations where I thought the scene would best be captured. I've been here to shoot this image 100 times, so I had the best spots surveyed out well before we ever arrived. As a side note, early on in our planning, I had made sure to discuss the camera's field of view so I could replicate it on my own camera. I wanted to be able to see exactly what the IMAX camera would see. After Brad surveyed the sites, he directed his camera crew to set up the massive camera and tripod in the exact location he thought he could best capture the sunrise scene. Brad, as the director of photography is responsible for everything that happens on the "set." Brad's been at this for over 25 years. He was on the team that took the the IMAX camera to Mt. Everest to film the movie, "Everest." That same year, a deadly disaster took the lives of 8 people. Brad was present when Rob Hall, and Everest expedition leader passed away from injuries suffered during the avalanche. glacier national park, imax behind the scenes wild goose island "national parks adventure"
As the sky began to brighten, Brad, working with his team, checked the light with a portable light meter, set the aperture, and focused the camera, he was ready to roll. Everyone anticipates the camera rolling. It's drama of a different sort. The camera is at the center of focus so to speak, as we wait for the light to arrive. Soon, Brad starts the camera. It clatters away, film reeling from one canister though the camera, to the canister on the opposite side. As I listened to it clicking away, everyone intensively watching the camera, then snapping my neck around to catch a glimpse of the scene, then back to the camera again, I couldn't help but think of the bygone era of mechanical film cameras. It was a nostalgic moment for me. The truth is, the detail captured by the film in this camera is still the gold standard for mega screen IMAX movies. Digital IMAX and 3d would be used to film parts of the movie "National Parks Adventure," but the film camera, for these scenes produced the best results. After the Wild Goose Island shoot, we packed up and soon were on to a new location. We managed two to three locations per day. For each day we planned a morning, and an evening shoot. Morning and evening offer the best light - you've all heard of the golden hour, well, that's when we had to be ready to shoot, come hell or high water. For our second location, the evening shoot, we changed location. We moved to another part of Saint Mary Lake. The image below is what it looked like as we waited for that golden moment. Understanding the local weather patterns was critical to this shot. I anticipated that the light would improve as it peeked through, and below the clouds, as it often does as the clouds build over the lake during the late summer and early fall. Below, is the dull, cloudy image showing why we were forced to wait. The rest of the crew knew that something magical could happen, but they, like me, were nervous that it may not. As luck would have it, the sun broke though, as predicted, and what a scene it was. It was, by anyone's standards, worth the wait. As the sun peeked though, I'm sure we all heard the same whimsical music in our heads - it was absolutely heavenly. The following day lead us to the shore of another lake, Lake Mcdonald, in Glacier Park's west side. The lake is near the Park entrance at West Glacier, Montana. In these images the camera was set up at the water's edge to put the end viewer front and center. Motion in IMAX film helps keep the viewers attention as many of the shot sequences are on screen for a minute, and sometimes more! That's a long time for any scene to stay on screen. It's possible to leave one scene on the screen for that long because of the immense size of the screen and the extreme detail captured with this camera. It gives people time to look around and really take in the entire experience brought to you by an IMAX theater. 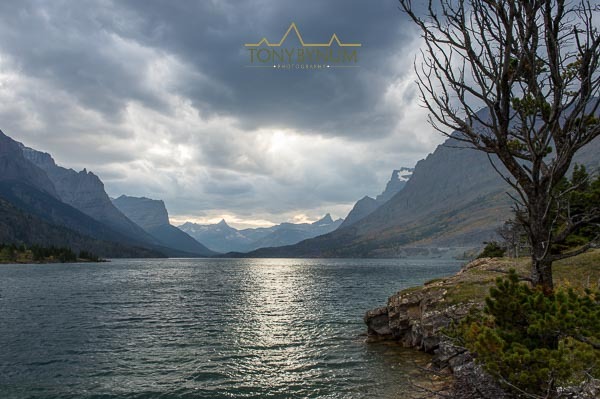 The next stop was along the Going to the Sun Road, just inside the Park's eastern entrance at Saint Mary's, Montana, a small town on the Blackfeet Indian Reservation and boarding Park. Behind the scenes photograph of "National Parks Adventure" movie crew setting up to film along the going to the sun road in glacier National Park, Montana. After this shoot, we planned to reshoot the Saint Mary Lake, Wild Goose Island location the next day. Unfortunately, when we arrived the wind's were typical for Glacier Park, blowing and spitting rain, not the best conditions for filming. We waited around for the wind to die down, but it never did. We regrouped and the team packed up and headed off to their next destination, Devils Tower in Wyoming to film Conrad Anker climbing the Tower. All in all, it was a fantastic shoot, and I'm happy to have been a small part of this historic documentary film. For me, the entire project started about a year before the shoot. MacGillivray Freeman Films called me to discuss the details of filming locations within Glacier National Park. They wanted the epic, grand views, the ones most of you have likely seen in photographs. I pulled together a set of digital maps, with photo points linked to photographs I've shot over the past 15 years, and sent them on to MacGillivray. Creating maps with key photo points linked to photographs allowed the team to share the critical planning elements among each other, without having to have everyone in the same room. They could simply bring up the maps, click on photo points, and reference the images of that location on their smart phones, tablets, or computers. After a few weeks looking over locations, and discussing the types of scenes the director was looking for, they hired me as the location expert and I become part of the team. As the location expert, it was my job know everything there is to know about the place. From how to get around in a timely manner, to knowing where the light's will be and when it's going to be right. One of the most most critical parts, is knowing what to do when plan A does not go as planned. The camera man has the ultimate say on the shot. It was my job to show the camera man the locations that I thought were best for the shoot, and discuss all the variable of each location in order for him to be able to make a wise choice about capturing it on film. IMAX film cameras shoot a maximum of 3 minutes of 77mm film. That's right, it still uses real film. Typically a rolling film shoot in the IMAX camera lasts from one to three minutes, one minute being the minimum. The camera holds three minutes of film, and a full film canister weighs 50 pounds. It takes about a hour and a crew of 3-5 people to set up the camera to shoot one to three minutes of film. If the film runs out, a new, full film canister and an empty receiving can is swapped out. The canisters are pre loaded and stored in a truck near the shoot location. The entire camera package is bulky, heavy, and cumbersome to move. Getting the camera and support gear into remote areas is a major, time consuming and very labor intensive endeavor. An interesting fact about filming in IMAX format is that it cost about $1000 per minute to run the camera. $1,000 dollars a minute! Of course you'd be captivated, anyone would be, by a camera that can spend more money in one minute than your entire day's wage! Here's is the 2 minute trailer to the film, "National Parks Adventure." Finally, I'd like to thank MacGillivray Freeman Films, Brad, and Rob, and the rest of the crew for putting up with my humor and for trusting me to provide them the very best, most trusted and knowledgeable service possible. To the National Park Service, Glacier National Park, for providing us with a fantastic park service monitors, all were helpful, polite, and did their jobs well! 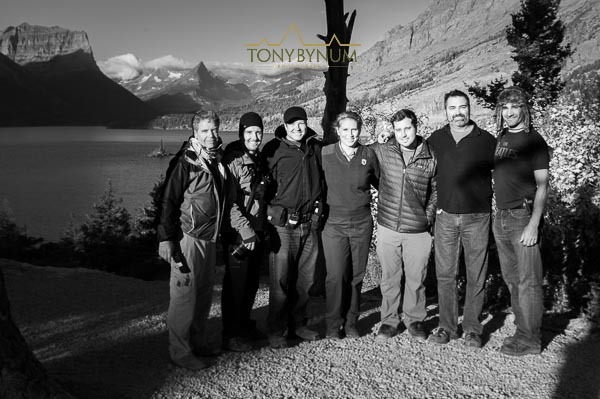 "National Parks Adventure" movie crew above Saint Mary Lake, Glacier National Park, Montana. I encourage all of you to go watch, "National Parks Adventure" in an IMAX theater. If you can please leave a comment, or ask any questions, I'd be happy to share additional thoughts or answer questions.